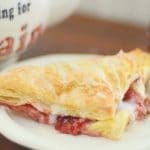 Easy turnovers have become an obsession of mine — and these easy strawberry cheesecake turnovers are no exception! I’ve been making pumpkin turnovers, apple turnovers and couldn’t wait to whip up a batch of this strawberry cheesecake version. And cheesecake? We have loads of fun cheesecake dessert ideas on this blog! Just check out our two top faves — Peanut Butter Cheesecake and Frozen Chocolate-dippeded Cookies and Cream Cheesecake Bites get started down easy cheesecake lane! I had no idea you could make semi-homemade turnovers. Yes, it’s an actual, real-life thing. And if you’re a busy mom, you absolutely have to try at least one easy turnover recipe! All you need is some awesome, wonderful puff pastry that all great grandma’s wished they had years ago. Then, you make some crazy-yummy filling and tuck it all inside those beautiful sheets of buttery, flaky pastry. Oooh! But the simple, easy turnover fun doesn’t stop there, foodie friend! We still need a lip-smacking, sugary glaze to add just the perfect amount of sweetness. 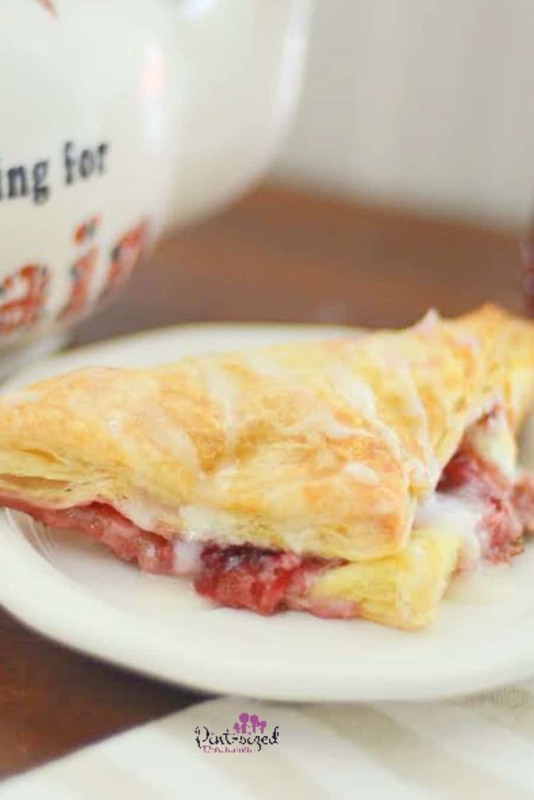 Here’s a secret: easy strawberry cheesecake turnovers make everyone be your best fried. Just try it. Husband mad at you? 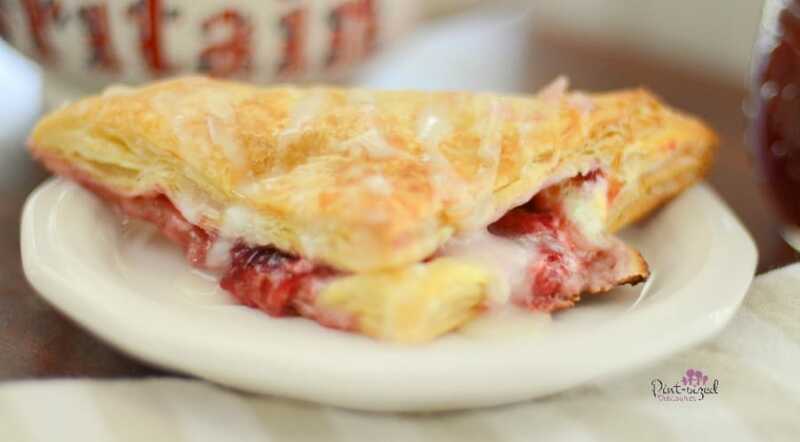 Make him a strawberry cheesecake turnover. Kids grumpy? 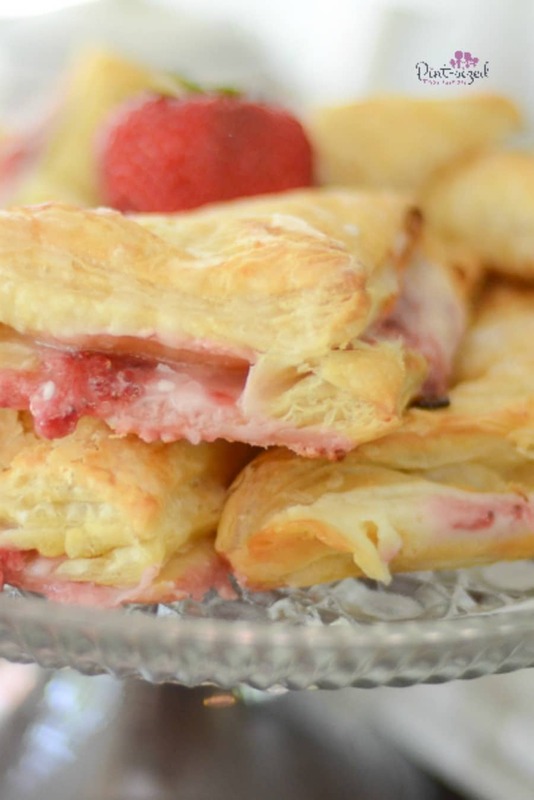 Surprise them with strawberry cheesecake turnovers. Mother-in-law complain about your lack of mom skills? Send over a few strawberry cheesecake turnovers. You can see how easy and yummy these turnovers are in the video below! Really good food makes people want to be your friends. And really good food makes troubles melt like lemon drops away above the chimney tops….ok I like musicals. Obviously. 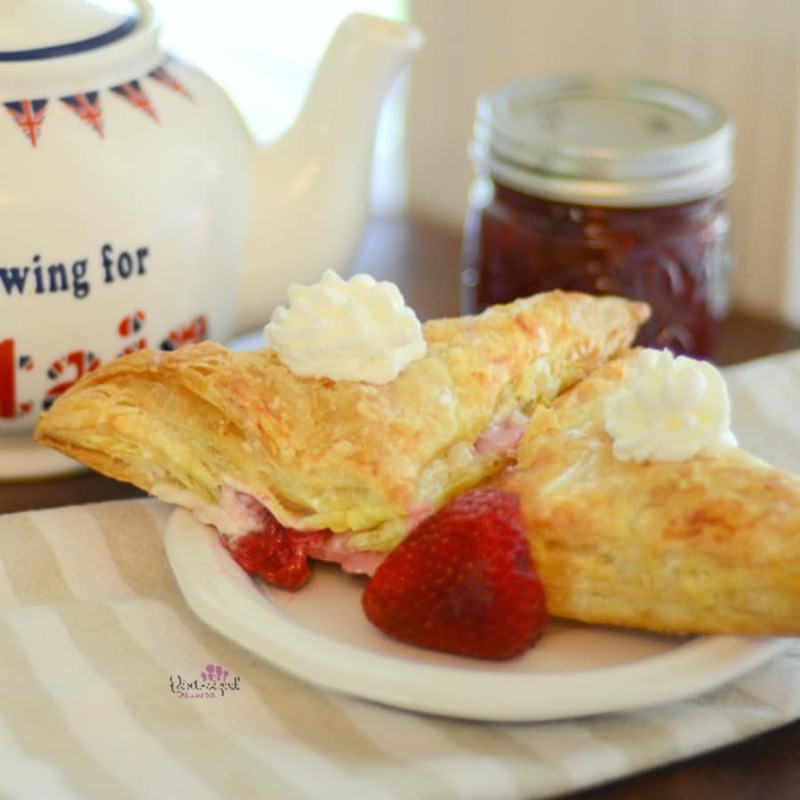 Whether your mother-in-law is mad at you or not, use any and every excuse to whip these easy strawberry cheesecake turnovers. Trust me on this one. You’ll be so glad you did! And when you’re finished gobbling these sweet pastries up, be sure to try our other easy turnover recipes! A favorite no-bake cheesecake recipe is all tucked inside a buttery, flaky turnover. But this recipe is easy-peasy and ready in minutes! Enjoy luxury turnovers without all the fuss! Definitely a favorite easy turnover recipe at our house. 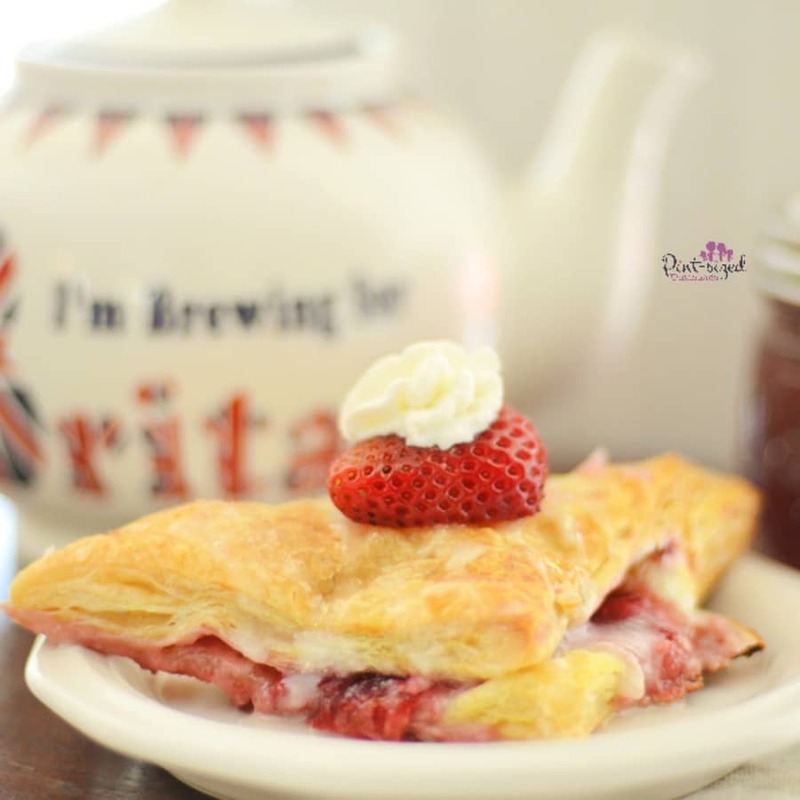 Strawberry cheesecake turnovers needs to be on your "must make" list! Place puffed pastry sheets on clean, dry surface. Cut each pastry sheet into four squares. Add the frozen or fresh strawberries to a small pot over medium heat. Add the sugar and cook the strawberries until they begin to fall apart. Mash the strawberry mixture until no large chunks remain (small ones are okay) and set it aside to cool completely. Whip the cream cheese, the powdered sugar, and the vanilla on high speed until well blended. Fold in the whipped cream with a rubber spatula until well combined. Fold cooled strawberry mixture into cheesecake mixture . Place one tablespoon of strawberry cheesecake on one half of each square. Fold over from corner to corner into a triangle shape, and press edges together to seal. Place turnovers on an ungreased baking sheet, leaving about 1 inch between them. If desired, crimp edges with fork. Cut three small indentations on the thickest part of each turnover. Brush with one beaten egg, if desired. When golden brown and puffed up, remove from oven and drizzle vanilla glaze on top using the prongs of a fork. Stir all ingredient together and drizzle over turnovers before serving.